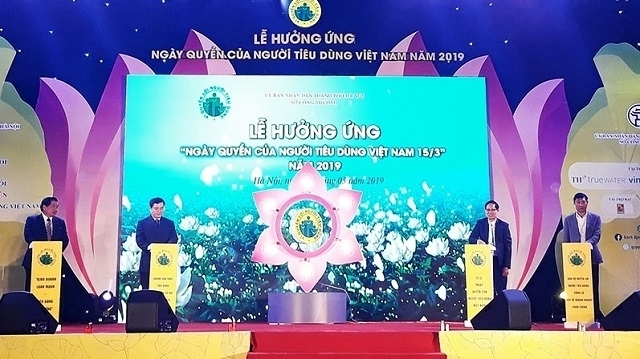 A meeting was held at Trinh Cong Son pedestrian street in Hanoi on the evening of March 16, in response to Vietnam’s Consumer Rights Day March 15, 2019. Celebrated on a national scale annually in March, the day aims to raise awareness on the importance of protecting the rights and interests of consumers, as well as affirming the role, position and importance of protecting consumers' rights alongside stable and sustainable development of the economy and society. According to Deputy Head of the Hanoi municipal Department of Industry and Trade Nguyen Thanh Hai, consumer protection is the protection of the whole society, as every citizen is a consumer. In fact, the Consumer Protection Law has been issued and widely propagated to help consumers be aware of their legitimate rights, which are protected by law. In addition to gratitude activities for consumers, this year’s programme also focuses on promoting propaganda and the dissemination of legal knowledge to consumers in the capital city, especially high school students, who are the future consumer class that are gradually forming consciousness in their shopping activities. Following the meeting, the "Enterprises paying tribute to consumers" week was launched and will take place from March 17 to 23 at 70 trading venues across Hanoi, offering gifts, discounts, warranty support and product maintenance services for consumers. From April 19 to 23, the "Product and goods festival for consumers" programme will take place with 50 stores run by prestigious brands and enterprises at Big C Thang Long supermarket campus, No. 222 Tran Duy Hung street, Cau Giay district.